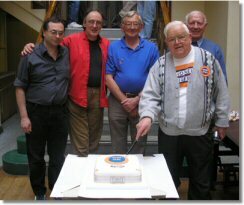 The Lionel Collectors Club UK was founded by Geoff Bull in 1979. The club is an informal group mainly living in the UK who share an interest in Lionel, and other American three rail 'O' gauge manufacturers, as well as a couple of members who are into 'S' gauge. The club had its 30th anniversary in 2011. We number about 65 members scattered over the UK, plus a few in Europe and overseas. Our main communication is via the Shortline Newsletter. This is published 4 times a year, and is usually 16 A5 pages. The magazine includes articles of interest relating to all aspects of American three rail 'O' gauge, the North American Railroads on which they are modelled, repair and service tips and items for sale and wanted. See our Annual Show page for details of our annual show and meet. 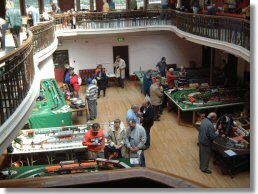 At our annual show held in Leicester there are typically 8 layouts, a couple of other stands, and plenty of discussion and trading. there is a club dinner in the hall in the evening, followed by half an hour running trains in the dark! We clear up Sunday morning. The 3 course show dinner with wine and coffee is for members and their guests. Some of our members exhibit layouts at local train shows where a number of us gather, but this depends on where you live. In the Sussex/Kent region, for example, there are two active members who exhibit a layout 2 or 3 times a year at shows. Despite the club name we run most US 'O' gauge brands, Lionel, MTH, K-Line, Weaver, Atlas 'O' and Williams by Bachmann. We find Lionel has the recognition in the UK which the other brands currently do not. Most of our members are operators, mainly 3 rail 'O', a few standard gauge, two 'S' and one Marx. If you are interested in joining, see 'Join LCCUK' for more information.